(Washington) – The Fund for Investigative Journalism (FIJ) is pleased to announce that for the fourth year in a row, the Nicholas B. Ottaway Foundation has donated $25,000 in support of FIJ’s grant-making program for independent investigative reporters. The funds will support the work of freelance reporters whose investigations are published in US media outlets. The Nicholas B. Ottaway Foundation’s journalism program supports press freedom around the world and seeks to improve the quality of journalism through grants to American journalism schools, investigative reporting projects, and online investigative news centers. FIJ board member David Ottaway also serves on the board of the Nicholas B. Ottaway Foundation. Reporter Adriana Cardona-Maguigad traveled to Puerto Rico to investigate why an influx of drug addicts from Puerto Rico now lived on the streets of Chicago. She found that addicts were given one way tickets to Chicago and other big cities with promises of drug treatment. But those promises were broken. Cardona-Maguigad was interviewed about her investigation for the public radio program This American Life. Vivekananda Nemana and Ankita Rao reported on the deliberate underreporting of malaria cases in India, which interferes with efforts to fight the disease. Francesca Lyman investigated Savers, the thrift store chain, and found their claims about helping charities were vastly overblown. Freelancer Jeanne Baron reported for NPR on World Bank projects that aim to fight poverty around the world, and found that while uprooting local people, project leaders don’t always follow World Bank rules for resettlements. Sandra Bartlett reported for the radio program, Reveal, on “disposable” workers in South Korea and Vietnam – exposed to toxic chemicals, then to reproductive disorders and cancer. Many of the victims are young women. Reveal is a nationally broadcast public radio program and podcast from the Center for Investigative Reporting and PRX. For more than forty years, FIJ has covered expenses for reporters who have the ideas, sources, and know-how to produce groundbreaking investigative journalism but need resources to complete their projects. Grant applications are currently being accepted through the FIJ website, http://fij.org/grant-application/, with an upcoming deadline of September 26. FIJ is also collaborating with the Schuster Institute for Investigative Journalism on a diversity initiative funded by the Ford Foundation. Applications for grants and fellowships for diverse journalists are being accepted at https://investigate.submittable.com/submit, through October 1. Kent Paterson of Frontera NorteSur, in the first of a series on small town governance, describes how the excessive levels of arsenic in water supplies along the southern border of New Mexico, a longstanding problem, was exacerbated by the complete break-down of two water treatment plants. The utility in charge of delivering clean water belatedly notified residents of a consistent pattern of violations, going back four years, but the lack of consistent, timely notifications was itself a violation of the Safe Drinking Water Act. “… some of the basic elements of Management 101 hadn’t been followed,” according to a local official. 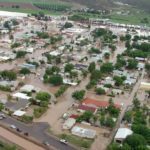 And finally, the small town of Hatch, New Mexico, having slowly recovered – by and large – from a devastating 2006 flash flood, struggles for a way to protect itself from future floods. The community is particularly vulnerable because most people living there have no flood insurance. With the assistance of the Fund for Investigative Journalism, I attended the Summer Conference of the Centre for Investigative Journalism in London on July 14-16, 2016. It was an excellent opportunity to improve my professional skills. The three-day conference included training sessions on various topics, and over 150 journalists from different countries of the world could choose panels that were most useful to them. What new things did I learn from this course? The focus of the CIJ Summer Conference was very much on data, with a wide range of sessions, from hands-on workshops to case studies. The session delivered by Bastian Obermayer and Frederik Obermaier, the two German journalists who played a large role in the reporting on the Panama Papers, was especially useful and provided me with lots of new journalistic insights. How should an investigative journalist collect the documents and data needed for his or her article? What principles should he or she follow to write an objective and interesting article? I received answers to these questions during the three-day conference. I would like to add that during this visit I discovered London because it was my first visit there. Visiting other countries is important for a journalist to expand their knowledge. I was able to do that thanks to the financial assistance of FIJ for which I am grateful. (Las Vegas) Directors of journalism grant and fellowship programs described the “transformative” impact the programs have on reporters’ careers, during a panel discussion at the 2016 national convention of the Asian American Journalists Association (AAJA), being held August 10-13 at Caesars Palace in Las Vegas. Among the panelists, Sandy Bergo of the Fund for Investigative Journalism described how its four decades-long grants program has helped reporters break big stories, such as the My Lai massacre. And she introduced a new diversity initiative that will award grants and fellowships with the Schuster Institute for Investigative Journalism to women and journalists of color, to help address the lack of diversity in the field of investigative reporting. LONDON — Gavin MacFadyen’s passion could be heard in his voice as he welcomed the scores of journalists and media professionals gathering for a three-day investigative journalism conference organized by the Centre for Investigative Journalism in London. Journalism in the UK and indeed globally was at a crucial stage, said MacFadyen, the centre’s director. Only good investigative journalism, he said, can help restore public confidence in the Fourth Estate. 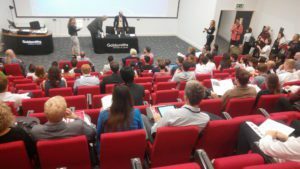 For three days, the attendees took part in seminars and training sessions at the Goldsmith University of London. As expected by anyone who has attended such journalism conferences, the first challenge facing an attendee was always deciding what sessions to attend. While the sessions involved various investigative techniques like story mapping, sourcing and so on, my primary interest was data journalism. (Washington) The Fund for Investigative Journalism (FIJ) has awarded $52,000 in grants to support the expenses of 14 investigative journalists working on stories in the United States and around the world. 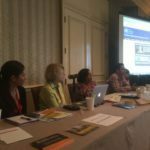 Grants from FIJ help freelancers and reporters working for nonprofit news organizations cover expenses such as document retrieval, travel, and equipment rental. (Washington) If you’ve got a great story, you can find the funding to get it done. That was the message from Phillip Martin, WGBH-Boston senior investigative reporter and a senior fellow at the Schuster Institute for Investigative Journalism at Brandeis University. 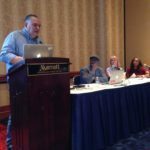 “There’s always a place for good journalism and there’s always funding for good journalism,” he told a packed conference room at the 2016 convention of the National Association of Black Journalists and National Association of Hispanic Journalists, held in Washington DC this week. Martin has won several grants and fellowships that allowed him to pursue stories that he wanted to do but his employer could not afford. His stories on human trafficking were honored with the national Edward R. Murrow Award. A 2012 fellowship from the International Center for Journalists financed the travel. If a grant or fellowship application is turned down, “do not give up,” said Martin. Oftentimes, an applicant can find out why the proposal was rejected, do extra research, resubmit and get the grant. Fund for Investigative Journalism (FIJ) president Ricardo Sandoval Palos moderated the panel on “Finding Funding,” and announced that several organizations have launched initiatives this year to provide training, grants and fellowships, specifically targeted for journalists of color, to address the “embarrassing dearth” of investigative reporters of color in the U. S.